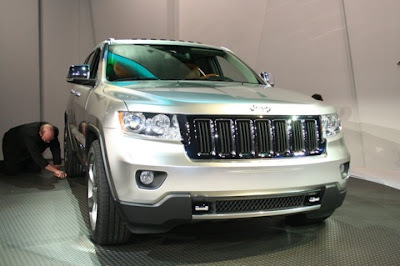 Chrysler announced a new design and the price of the Jeep Grand Cherokee 2011. New Grand Cherokee has fantastic features, such as the revised cabin, all new sheet metal, the new 3.6-liter V6 Engine Pentastar and upgraded suspension. 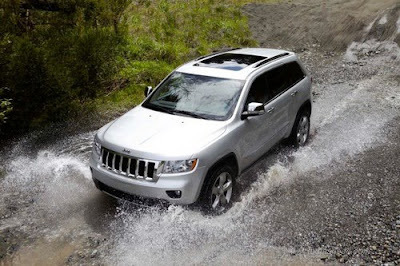 New 2011 Grand Cherokee Laredo 4 x 4 will start to $ 32.995, and Grand Cherokee Laredo 2011 4 × 2 starting at $ 30,995. The new V6 increases gas mileage by 11%, for 23 mpg highway (US) — over 500 miles per tank. The interior provides over four inches of increased rear-seat knee and leg room, and 17 percent more cargo volume (as released first on allpar.com). Numerous safety features are standard, and options include Blind-spot/Rear Cross-path detection and Adaptive Cruise Control with Forward Collision Warning, along with FloTV, satellite TV, and Internet router. The Laredo includes keyless entry, stability control with anti-roll, hill start assist, trailer sway control, side curtain airbags for both rows, active head restraints, power driver's seat, fog lamps, leather-wrapped steering wheel with audio controls, satellite radio, and 17-inch aluminum wheels; the 360 horsepower Hemi V8 will be optional. That model starts at $32,995. The Limited adds Quadra-Trac II® with Selec-Terrain (if you get the 4x4), front and second-row heated leather seats, memory settings, High Intensity Discharge auto-leveling headlamps, CommandView dual-pane panoramic sun roof, rear back-up camera, rear park assist, premium audio, automatic temperature control, 18-inch aluminum wheels, Garmin® navigation, rain-sensitive wipers, and bright door handles. The price for Limited is $39,995 including destination. The ultimate Grand Cherokee, the Overland model, adds the Quadra-Lift air suspension (if you get the 4x4), premium interior with Nappa leather-trimmed and heated seats, vented front seats, wood/leather-wrapped heated steering wheel with memory, power tilt/telescope steering column, wood bezels, leather-stitched instrument panel/doors/center console armrest, power liftgate, and 20-inch aluminum wheels. That model starts at $42,995 including destination.